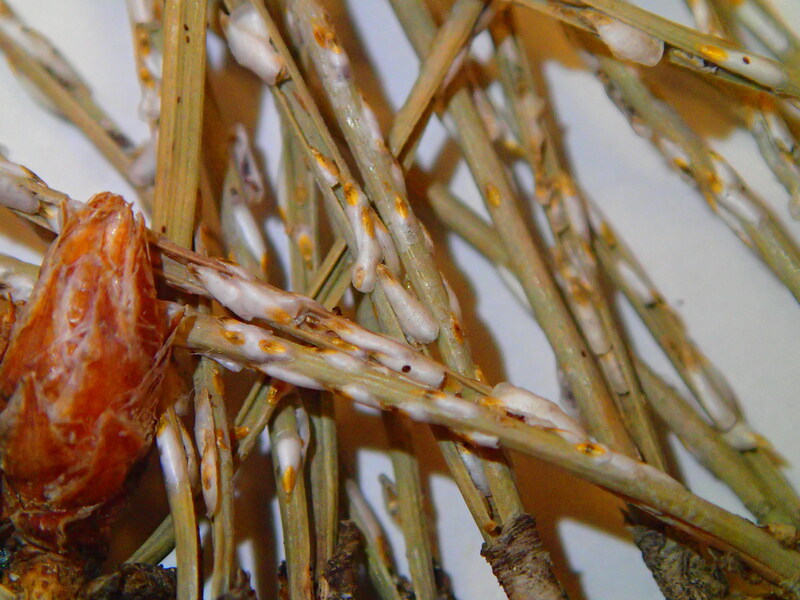 Pest description and damage Pine needle scale are elongate, pure white scale which feed on the needles. The scale beneath the covering are reddish-orange, with rusty colored eggs. Heavily infested trees may appear crusted with white. Infested needles turn yellow, then brown. Twigs and branches may be killed. Repeated infestations may kill trees eventually. Pine needle scale often are found with the black pine leaf scale, which are gray to black instead of white. 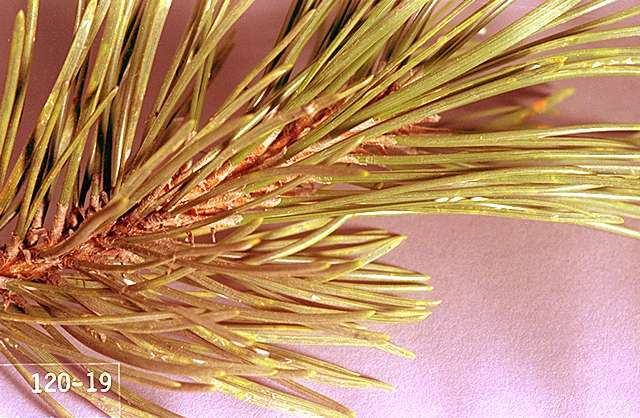 Pine needle scale also infest ornamental pines, arborvitae, cedar, hemlock, spruce and Douglas-fir. Biology and life history The insect overwinters as eggs beneath the female scale cover. The eggs hatch in May or June, and the reddish crawlers migrate to a new part of the host tree or are blown or carried to new hosts. One or two generations occur, depending on location. If there are two generations, second generation crawlers are found by midsummer. Pest monitoring Check pines that appear yellowish or unthrifty. Look for white scale protected inside the curved interior of the needle bundles. Occasionally trees are visibly white with scale. 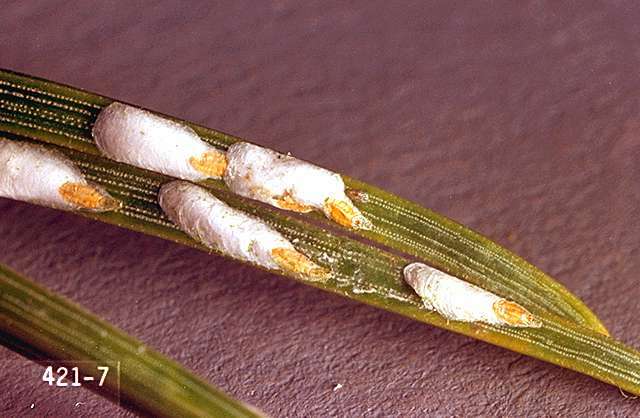 Since scale insects don't fall off, check to be sure that the scale are still present under the scale-covering or that crawlers are on the foliage before initiating pesticide application. Keep plants healthy with proper watering. Populations are reported to build more rapidly on stressed or dusty plants. Small numbers are easily tolerated and provide food for parasitoids which keep this scale in check. Parasitoids, lady beetles, and birds feed on this scale. Holes in scale are made by exiting parastoids. The whitish residue on the needle indicates where a scale has been eaten; both are evidence of natural enemies at work.